Brown University engineers have created a new battery that uses plastic, not metal, to conduct electrical current. The hybrid device marries the power of a capacitor with the storage capacity of a battery. A description of the prototype is published in Advanced Materials. That's the question Palmore set out to answer with Hyun-Kon Song, a former postdoctoral research associate at Brown who now works as a researcher at LG Chem, Ltd. They began to experiment with a new energy-storage system using a substance called polypyrrole, a chemical compound that carries an electrical current. Discovery and development of polypyrrole and other conductive polymers netted three scientists the 2000 Nobel Prize in Chemistry. The result is a hybrid. Like a capacitor, the battery can be rapidly charged then discharged to deliver power. Like a battery, it can store and deliver that charge over long periods of time. During performance testing, the new battery performed like a hybrid, too. It had twice the storage capacity of an electric double-layer capacitor. And it delivered more than 100 times the power of a standard alkaline battery. But Palmore said the new battery's form, as well as its function, is exciting. In width and height, it is smaller than an iPod Nano. And it's thinner, about as slim as an overhead transparency. "You start thinking about this polymer and you start thinking that you can create batteries everywhere out of it," Palmore said. "You could wrap cell phones in it or electronic devices. Conceivably, you could even make fabric out of this composite." Palmore said some performance problems – such as decreased storage capacity after repeated recharging – must be overcome before the device is marketable. But she expects strong interest. Battery makers are always looking for new ways to more efficiently store and deliver power. 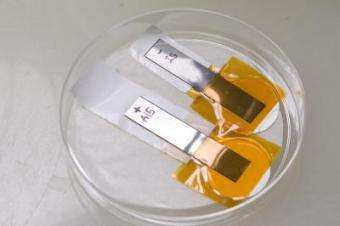 NASA and the U.S. Air Force are also exploring polymer-based batteries. "What we've got is a good concept," Palmore said. "Put electroactive molecules into conducting polymers and you can come up with all sorts of interesting materials that store energy."